Bristol poet Miles Chambers gave a fantastic series of poetry workshops in Bristol schools organised by Ablaze, thanks to a kind donation by Bristol Airport. The workshops were held to celebrate Ablaze’s fourth poetry competition and to inspire children to pick up their pens and enter the competition. The theme for this year’s poetry competition is ‘Travel’, and full details can be found on our website. The closing date for entries is Friday 15 February 2019. Workshops took place at Wrington Primary School, Cabot Primary School, Hareclive E-ACT Academy and Glenfrome Primary School in November, December and January. 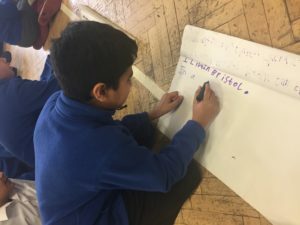 The teachers and children that took part thoroughly enjoyed the workshops, where they worked in groups to create a poem through a game of ‘consequences’, as well as getting lots of tips about how to write and perform poetry. PreviousPrevious post:Cabot Primary Pupils visit MShed thanks to National FriendlyNextNext post:West of England Mentoring nominated for an award.